After being in the rumours from last few weeks, Pixel 3 and Pixel 3XL have been officially unveiled by Google at #MadeByGoogle hardware launch event in New York on October 9. It’s not too much surprised when we look at the specifications sheet of Google Pixel 3 and Pixel 3XL. Both smartphones come with a similar dual-tone matte finish but this time the search engine giant has offered glass back panel. Interestingly, Google has provided alluring colors including Just Black, Clearly White and Not Pink on Pixel 3 and Pixel 3XL. The Pixel 3 duo features a big screen, improved cameras and louder front firing speakers as compared to Pixel 2. The Pixel 3 and Pixel 3 XL shares similar specifications but with minor changes in display, battery, and design. 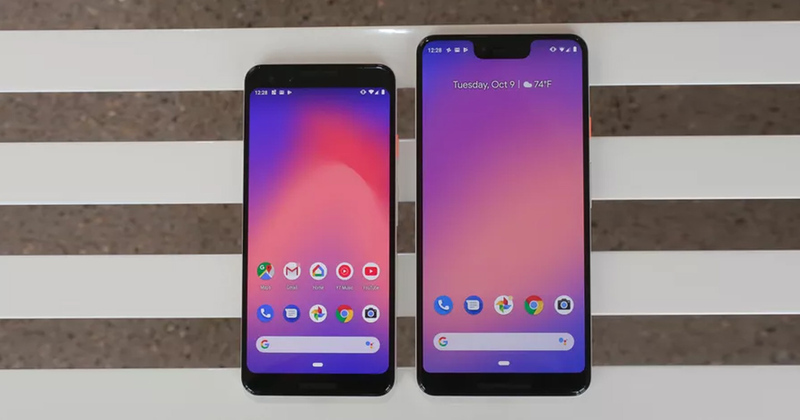 Pixel 3 has a 5.5-inch display screen, whereas the Pixel 3 XL bears a 6.3-inch display screen. The key highlights of newly launched Google Pixel smartphones include Qualcomm Snapdragon 845 SoC, 4GB RAM, 12.2-megapixel rear camera, dual selfie cameras, and more. Interestingly, the new Pixel 3 devices has been bundled with a Pixel stand which supports wireless charging. In the U.S market, Google Pixel 3 comes with a price tag of $799 available for pre-registration, though it will be available for purchase from October 18 particularly in the US market. Google has reported that the Google Pixel 3 and Pixel 3XL will be available from November 1 in 12 markets including India. In India, Pixel 3 64GB and 128GB storage variants will be available at Rs. 71,000 and Rs 80,000 respectively. On another hand, the Google Pixel 3XL will be available at a starting price of Rs. 83,000 for low- end 64GB variant and goes up to Rs. 92,000 for high- end 128GB variant. In India, the pre-bookings of new Google devices will commence from October 11 and the deliveries will start from November 1. These smartphones will be available for purchase at offline and offline retail stores across India. The Pixel stand, a wireless charger specifically designed for Pixel devices which will be available at Rs. 6,900 in the Indian market. In India, Google has listed that the Pixel 3 and Pixel 3XL will be available at retail online stores namely Flipkart, Reliance Digital, Croma, Poorvika, Bajaj Electronics, and Vijay Sales. It must be noted that the Pixel 2 XL (64GB) will be available for purchase at Rs. 45,499. Interested users can avail enticing offers on pre-booking the Pixel 3 and 3XL. Flipkart E-commerce, platform has listed various offers like No cost EMI starting at just 3,945 per month, 10 percent cashback by making payments via PhonePe, Axis Bank Buzz Credit Cardholders are entitled to avail an additional 5 percent discount. The users can also avail 50 percent buyback scheme by purchasing the policy at just R s.199. Under the buyback scheme, the users can change the Pixel 3/Pixel 3XL device within 12 months of purchase. The Google Pixel 3 bears a 5.5-inch full-HD+ OLED display which offers 18:9 aspect ratio and 443ppi pixel density. On another hand, Pixel 3 XL comes with a 6.3-inch full-HD+ OLED notched display along with 18.5:9 aspect ratio and 523ppi pixel density, On the top, both smartphones have been protected with Corning Gorilla Glass 5. Under the hood, there is a Qualcomm Snapdragon 845 processor coupled with Adreno 630 Pixel Visual Core and Titan M security to offer end-to-end encryption of data on Pixel 3 and Pixel 3XL. For storage content, the Pixel 3 Duo comes with 4GB RAM and 64GB/128GB internal storage configuration. It will be shipped with Android Pie 9 out-of-the-box. Under the hood, Google Pixel 3XL is armed with a 3430 mAh battery, while the Pixel 3 has been equipped with 2915 mAh Battery. Both smartphones have dual cameras on the front side, whereas on the rear panel the smartphones feature a single camera, fingerprint scanner and an LED flash. Top Shot automatically feature lets the users capture the alternate shots in HDR+ mode enhances the photography experience, while Super Res Zoom has a burst mode which combines several photos at a time as well as offered sharper zoomed images. Furthermore, the newly launched Furthermore, the newly launched Google Pixel devices have been equipped with Google Lens in the camera set up.